The Crazyflie 2.0 has been flyable in MoCap systems such as Qualisys, Vicon or Optitrack for quite a while thanks to the Crazyswarm project. For the MoCap systems to be able to track the Crazyflie it needs to be fitted with reflective markers. These can be attached on e.g the motor mounts which in some cases might be the best solution, however we also liked the idea of creating a deck where the markers easily can be attached and in many, repeatable configurations, that is why we created the Mocap deck. This deck is now soon to be released but before we start manufacturing it would be great to get some feedback. The deck has M3 sized holes which is spaced on a 5mm grid. The deck also has footprints for two optional push buttons that can be used to e.g. trigger a take-off or start of a demo. And as the battery holder deck, which has no electronics, so this can be mounted upside down for better fitting of the markers, if the buttons aren’t mounted of course. We are collaborating with Qualisys, also based in Sweden (in Gothenburg), to make the Crazyflie more moCap friendly and make it easy to use together with the Qualisys system as well as other mocap systems. Qualisys will provide the markers for the moCap deck. Qualisys and Bitcraze are exhibiting together at IROS in Madrid where we will show some awesome demos with a moCap system as well as other position technologies and we are also hoping to fly a Crazyswarm. We will publish more information when we get closer to the conference. It would be good to look into an active version, where IR LEDs are mounted instead of passive markers. Unfortunately, the required marker size highly depends on the exact mocap setup. I believe active IR LEDs have potentially a wider range and a lower effect on aerodynamics etc. We have been discussing this as well however the different systems have different types of active markers so might increase the complexity. This is something we will for sure work more on though and as you say, active markers have meny pros! What is the minimum number of cameras and markers required to control the Crazyflie? How dependent is the number on the volume of the flight envelope? I don’t have any experience with MoCap systems. What can I expect to pay for cameras and software? 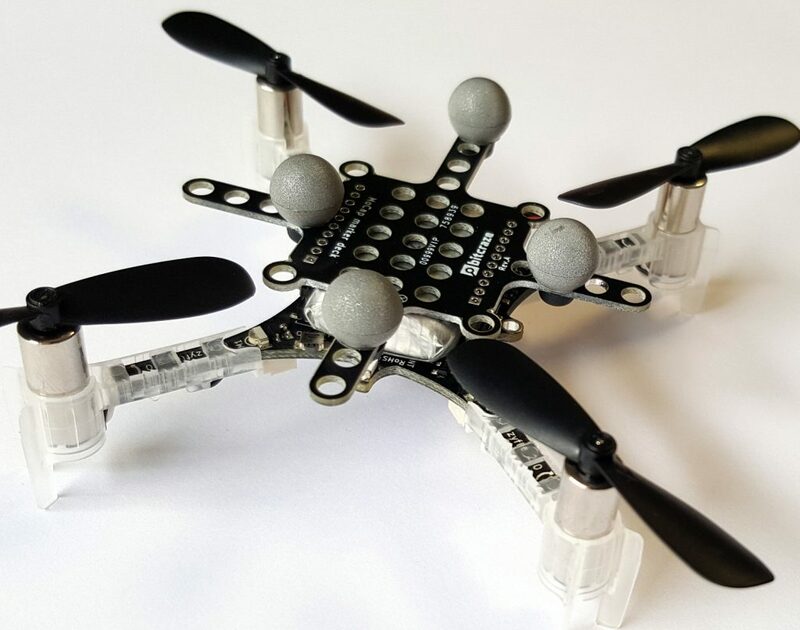 I recognize there is a range, but if I was to only control a single Crazyflie in a 1 x 1 x 1 meter space what is the minimum hardware I would need? Unfortunately I do not know the answer to these question. You should contact the mocap system manufacturer with your requirements and they will be able to tell you what you need and how much it costs. In our Qualisys system we cover about 4x4x3m with 6 cameras and using 9.5mm diameter markers we have no problem tracking the Crazyflie. Using smaller markers we have had problem having stable tracking on the ground. Looking forward to purchasing the moCap deck! Looks super fun! Hello! I’m doing a project using several Crazyflie quadrtors and the OptiTrack camera network. We attach the markers on the motor mounts, but sometimes the propellers block the markers. The MoCap deck looks fantastic! I was wondering where I can purchase them. Thanks! The MoCap deck is still not released but we hope to get it ready by end of Q1.